I’ve been asked several times about which headset can work with SO-20. Here is the headset jack spec for the IPEVO SO-20 Skype Wifi phone. According to the IPEVO people, Nokia Stereo headset HS-47 (Link at here) is compatible with the SO-20. One of my co-worker’s daughter is currently studying English literature in college at Taiwan. I’ve asked her to say something about how Skype helps her student life in the college. Here is the result. Here is my review for the latest and the greatest Skype WiFi phone: IPEVO SO-20. Hello. This is Howard Chang from AmperorDirect. 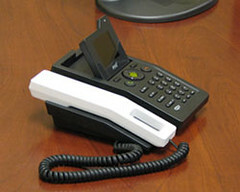 Today, I want to present the latest Skype Wifi phone from IPEVO. Before I start reviewing the phone, let me say something good about IPEVO. While big name players, such as GE and Philips, are retreating from the Skype accessory market, IPEVO is the only one I know who still actively rolls out new products to fill the void. They should be recognized by their good will and the effort to serve the industry. Now, if they can come up with a new Dect PC-Less Cordless phone or a PC-Less USB-to-RJ11 Skype phone adapter, it would be even better. OK, let’s look at the phone. This is the retail package. At the first glimpse, I was confused by the picture on the cover. Shouldn’t the phone come with a charging cradle as IPEVO advertised? Yes, it surely does. On the back of the package, it mentions “charge cradle included”. If I were the package designer, I would put the charging cradle picture on the cover, too, because it is a very good selling point. But, I can fully understand they want to focus on presenting the phone. In the box, we have the manual, the phone, the battery, the charging cradle and the AC adapter. Compared to the accessory list of our previous favorite: SMC wifi phone, it has an extra charging cradle included, but doesn’t come with the headset. If the IPEVO SO-20 has the similar functions, features and performance, a price point in the $140 range is reasonable. Let me assemble the phone and you can take a better look at the phone. OK, here it is: the IPEVO Skype wifi phone sitting on the charging cradle. I like the look of the design. It is a little smaller than its competitor, but carries the same size colored 1.8” LCD display. I can hold it comfortably in my hand – not too big, not too small. The key pads are designed with the curved edge to provide an elegant look. When you click on the buttons, the feedback force level is just right. The volume controls are at the side of the phone. And, the 2.5mm headset jack is on the other side. The only thing which can be improved are the four navigation buttons. They are a little bit too small. It is easy for me to hit the other buttons while doing the left or right navigation. I like the joystick design in the SMC phone better. However, I also understand that if the button design is done right, the design is simpler and might provide longer life. Let me run through the basic functions of the Skype wifi phone just in case this is the first time you have looked at one. 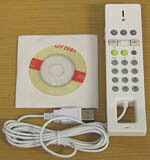 The phone has a Skype program built-in, and can let you conduct Skype calls without using a PC. What you need to do is to make the phone connect to your wifi network, sign in your Skype account and you can walk around in the wifi range and talk. The phone supports WEP and WAP security settings. However, it does not have a browser built-in, to handle the web-base log-in process. Therefore, it is more suitable to use in your home, your office or at a public place which provides open wifi network. You cannot use the phone in a paid hot-spot or some hotels which force users to use web-base sign-in process. Let me put the phone back in the cradle to charge the battery. I’ll come back to finish the review when the charging process is completed. Ok, the charge is done. It is recommended in the user manual to perform a 3 to 5 hrs full battery charge before the first time using the phone. When you turn on the phone, you need to connect the phone to the wifi network and sign in your Skype account. I’ve already done those boring steps to save us some time. Just be aware if you have more than 500 contacts in your contact list, the phone will take a very long time to finish the contact downloading process. The sound quality is acceptable. It can at least match the cell phone conversation quality. Like all the Skype wifi phones on the market, the conversation quality is largely dependent on the quality of your wifi network, and the connection between your wifi router to your calling destination. I have experienced crystal clear sound quality when using this phone to call our China factory. They just love the call quality and want me to keep using this phone to do our daily conversations. I have also experienced so-so call quality when contacting people in US. My suggestion is when you encounter a bad call, just hang-up and repeat the call. Skype might route you through a better connection and solve your problem. Or, you can check out the following webpage and ask the call receiver to perform a technical check on the connection quality. You might find some good data reflecting your call quality there. One thing which I need to perform further investigation is on the battery life. When comparing the spec, the IPEVO wifi phone carries a 3.7V 900mAh Li-ion battery, while the SMC wifi phone carries a 3.7V 1200mAh Li-ion battery. Supposedly, the IPEVO SO-20 should have a shorter talk and stand-by period. However, on paper, it offers a similar usage time. Maybe its miniature design has helped to save some power consumption. Maybe, two companies have their tests done in different test conditions. I’ll need to perform my own test to find out the results. I will also post the results on my blog later. No matter what the result is, I think IPEVO is taking the right step by including a charging cradle in the box. With this cradle sitting on a desk, people can better organize the cables and are more likely to put the phone back for charging. In the end, you might not notice the difference of the battery life because it is always in full charge mode. OK. Here is the conclusion for today’s review. IPEVO has done a good job in designing the SO-20 Skype Wifi phone. I like its elegant look. Sound quality can be very good when the network connection quality is good. IPEVO Skype Wifi phone comes with a lower capacity battery. But with the charging cradle included, you might not notice the difference in talk and stand-by time. Thanks for watching my review on the IPEVO SO-20 Skype wifi phone. Please send in your questions or feedbacks. Here is a review of Asus AiGuru SV1 Skype Standalone Videophone from our customer. Pros: Good sound / video quality, easy to use, easy to setup. Cons: The battery life can be improved. I guess the 20mins battery life is related to the manufacturer’s design philosophy. The battery is designed just for short term use. You can temporary move around with the AiGuru SV1 while conducting Skype calls. However, it’s better to find a power outlet and have the device hook up to it if you anticipate to talk for a long time. Come to check out our Skype Thanksgiving Crossword Puzzle. If you complete it and send us your result / information, you are in for the $100 Bestbuy Gift Card give-away drawing. Who in US cannot use extra $100 for the coming Black Friday shopping! PS. This is a very easy puzzle. However, here is the hint page just in case you need any help. Am I the Expert Yet? This one supposed to be posted in our new blog only. I want to keep all our Skype articles at here and the HD entertainment related articles at the new blog. However, I can never make the Google Analytics work there. Before that happens, I’ll put our HD articles at here, too. My name is Howard Chang. I work for an online e-commerce store called AmperorDirect.com. We sell Skype products and accessories. In the middle of this year, I was assigned to open an HD entertainment category for our store. However, I was not familiar with this category until that point. I didn’t own a big screen TV or a Bluray disc player and had no experience in setting up home theater equipment. I needed to dedicate a lot of time to study the terms and technologies related to this industry. After months of preparation and several visits to vendors in China, we have decided to start a new HD category, stemming from the Digital Media Streamer related products. The reason is very simple. First, we don’t want to get into direct competition with the big guys, such as BestBuy or Amazon.com on the popular and commodity type products, such as LCD TVs, at the beginning. Besides, we are from the computer industry. The major feature of the media streamer is to enable users to playback their digital contents stored in their computers on a big screen TV. If we start with this category, we at least are starting with something we are familiar with. Eventually, we will become the experts in the HD entertainment industry. This is essential in order for our new category to survive. We think this can also be a fun journey and we want to record what happens throughout. Hopefully someday this blog will offer help to another individual who decides to equip himself with the knowledge about the HD entertainment industry. We have created a community at Ning.com. Come visit us and enjoy the better community interactive functions at there. In the below Youtube file you will see our “How to Log-in Multi Skype Accounts at one Win XP Machine” video clip. The full script is at Here. In the below Youtube Clip you will see our “Fax Via Skype” video clip generated by our new sales lady. Nafcom has post his review of IPEVO Solo. He has listed his experience in a very detailed but clear way. I also like the Pros and the Cons stated at the end of the article. They are all on point. Go take a look. Over the past two years+ there have been many changes within the Skype Hardware landscape. 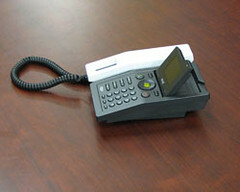 If you are new to the market and want to know where we have been… we have a short USB Internet Phone article. What can we learn from history? Where is the hardware headed? Nafcom has post his experience in using TRIO. He likes the sound quality of the speaker phone, but has problem with the cord arrangement. Go take a look. SOLO is the latest IPEVO release; and their first to move the Skype conversation out of the computer box. 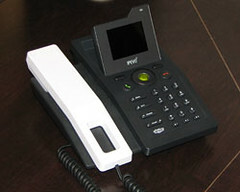 Connecting IPEVO SOLO to your router or cable modem, you will get a true stand-alone PC-Less Skype desktop phone. IPEVO SOLO is currently available in some Asian countries and will reach the US coast very soon. What’s in the IPEVO SOLO Box? 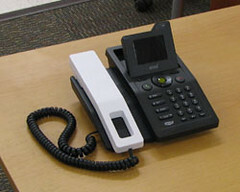 IPEVO SOLO is a decent designed Skype desktop phone. 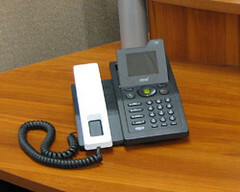 With the embedded version Skype software provided by Skype, it can handle the Skype incoming and outgoing calls without the need of a computer, and can do most of the extra functions such as speed dial and call diverting that we see on other PC-Less phones such as Netgear SPH200D and GE 28310EE1. However, there are some unique features which make the IPEVO SOLO stand out from its competitors. The first thing I notice on IPEVO SOLO is the beautiful large sized LCD display. You can see a comparison of the screen on IPEVO SOLO and Netgear SPH200D at the side picture: a picture is worth a thousand words. The big display on IPEVO SOLO does make the phone operation easier. For example, it is the first PC-Less phone that can fully present a long Skype ID, such as the “Echo / Sound Test Service”, on one screen. (Previously, the PC-Less phone will set the highlighted Skype ID to scroll mode so that the user can view the full name.) With this, IPEVO SOLO enables users to find the correct contact name on the screen faster. Yes, this old feature that used to be seen on a high quality home phone has finally made onto a Skype phone. The IPEVO SOLO handset is magnetized and thus can stay firmly on the base unit (which is also magnetized). The reason I like products from IPEVO is this company always take extra steps to think through what potential users need. On the back of IPEVO SOLO’s base unit, there is a WAN port and a LAN port. An IPEVO user doesn’t need to buy an extra switch / router or sacrifice the network connection to the computer, if there is only one network connection available. 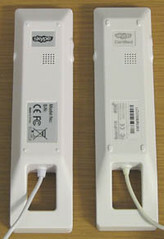 Just plug in the network cable from the modem to SOLO’s WAN port and connect the computer to SOLO’s LAN port, both the SOLO and the computer can be online simultaneously. In addition, IPEVO SOLO provides four different network connection modes: DHCP, static IP, PPPOE dynamic IP and PPPOE static IP mode. This should be able to cover all the possible real-use situations. 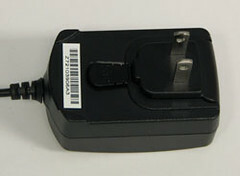 The AC power adapter of IPEVO SOLO is rated at 100~240Vac. There is a push button on the adapter to pop out the plug. With the right plug, IPEVO SOLO has the potential to be used in domestic and oversea. However, at this moment, it is not clear if the final US version will include the European plugs. In the Asian version, each IPEVO SOLO comes with a unique pre-registered Skype account (w ID and password). This feature can be helpful if I want to send IPEVO SOLO as a gift to a person who has limited computer knowledge. Again, it is not clear if the pre-registered Skype account will be included in the final US version. 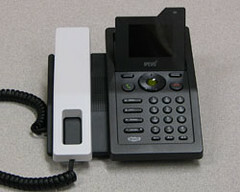 The IPEVO SOLO we purchased comes with a black base unit and white handset. There is also a black handset version available. I have mixed feedback from my co-workers about the IPEVO SOLO design. But, those feedbacks can be very subjective basing on my co-workers’ taste. I think the best way for me to do is to provide pictures with IPEVO SOLO taking from different angles and on different table surfaces. You can make your own call. The best way to describe my IPEVO SOLO sample voice quality is it can match the cell phone audio performance. I get distortion here and there in my testing but the overall quality is ok. It is a little disappointed especially after seeing what IPEVO can do on FREE1 – a USB phone. However, I also understand the issue might be on the embedded version Skype software provided by Skype. It comes with the 8KHz audio sampling rate. If IPEVO tries to upgrade it to 16KHz to match the sound quality on FREE1, the cost would go up. The other possibility is we purchased a bad unit. The unit is from an auction site and I don’t know whether it is a pre-production unit or not. After reporting this issue to IPEVO US, I had a chance to talk to their tech support in California (he was on a SOLO too). The strange thing is that I can hear him ok on my SOLO without those distortions. I’m kind of making the conclusion that my unit is bad. I’ll report the audio quality again when I can get a hold of a US version IPEVO SOLO. As usual, I’ll provide my wish list for the next generation IPEVO SOLO. Build a dualphone to handle both Skype and PSTN calls. There is a USB port in the back of the SOLO. Can we connect a webcam to the port and do Skype Video using that big LCD screen? It will be a stand-alone PC-Less Video phone!!! This is what I got from Skype. They are extending the subscription period of Skype Pro, Skype Unlimited, SkypeIn and Skype Voicemail for 7 days, for free, to compensate the crazy blackout happening last week. You may or may not know but last week Skype wasn’t available for a couple of days. There were a number of reasons for this and I am delighted to say that the problem is now well and truly sorted and everything is back to normal. For those of you who tried to use Skype during that time but couldn’t, we’re very sorry. For those of you who didn’t try to use Skype – well thankfully you were not affected but we want to reassure everyone that Skype is now working happily and the problem is fixed. We know we have many faithful users out there who give us feedback (good and bad) on what we’re doing as a company. The Skype community makes us what we are. Without you, our users, we simply wouldn’t exist. We’ve helped people stay in touch with their friends and family over the past four years without any massive hitch and we want it to stay that way. When the unexpected happens, it’s important to remember the people who stuck behind us and whose loyalty humbled us. I want to thank everyone for their support, patience and being part of the Skype community. And for those of you who missed out on using Skype last week – I want to especially thank you as well. So please enjoy it, call your loved ones, friends, family and colleagues and thanks again. Finally, my Skype account is back to normal. It is unfortunately that the Skype Outage happens when I am on the road for a business trip. Now I realize how easy and convenient to use Skype and how much I depend on it. 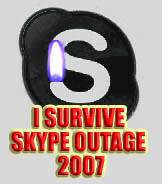 I’ve made this “I survive Skype Outage 2007” icon. You are welcome to download and use it. Hope I won’t need to do another icon anymore. 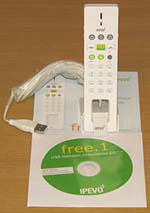 IPEVO FREE.1 has been available on the US market for quite some time now. I won’t go through another detailed evaluation because there are already several good reviews available on the Internet (For example, see the review done by Bill Campbell at Skype Journal). I’ll focus on comparing the difference between IPEVO FREE.1 and the knockoffs which have been flooded on eBay and helping users to pick the authentic IPEVO FREE.1 from the fakes. Along with the IPEVO FREE.1, I put two knockoffs I found on eBay in the picture. For convenience sake, I’ll call the left one as “white knockoff”, and the right one as “black knockoff”. It is easy to tell the difference between IPEVO FREE.1 and the black knockoff. The most obvious thing is that the three gray customizable function buttons seen on IPEVO FREE.1 have been taken away. 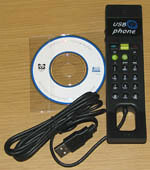 An “USB phone” text label has been placed at the location. You can also see that the plastic package of the black knockoff is kind of weak. The plastic has already been pushed and damaged when it arrived in the USPS priority mail bubble envolope. The white knockoff looks almost identical to IPEVO FREE.1. The good thing is that there are still several small things to look for. IPEVO’s logo is not shown on the white knockoff. 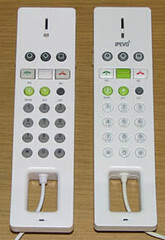 IPEVO FREE.1 has the number keys designed as transparent and the white knockoff has them in grey. The power-on led on IPEVO FREE.1 is shaped in square, but it is shaped in circuit on white knockoff. The up-down navigation button is colored in green on IPEVO FREE.1, but is colored in white on white knockoff. 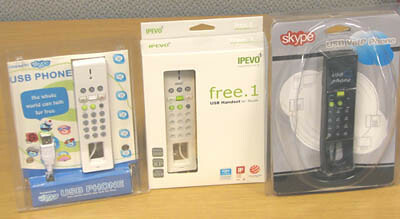 With the information above, you should be able to pick the authentic IPEVO FREE.1 from the fakes. The ability to do 16KHz audio sampling rate has enabled IPEVO FREE.1 to provide a crystal clear Skype conversation. The audio quality of black and white knockoff is not anywhere closed to what IPEVO FREE.1 can offer. Using both knockoffs, I can hear background “white noise” whenever one of conversation participant (either the caller or the called part) is speaking. The buttons work flawlessly on the IPEVO FREE.1, with the included software. There are three customizable buttons which allow users to pick from the following functions: Start Chat, Redial, Hold, Ringer Style Setting, Change Status, Play a Voice Mail and Send a Voice Mail. I find it very convenient to have the flexibility. IPEVO FREE1 also provides a “+” button for users to conduct SkypeOut calls. For the black knockoff, all the basic keypads, such as number keys and call/hang-off buttons, are designed on the phone and work with the driver installed. However, the number 2 button has already decided to go bad from the moment I pull it out from the box. It looks to me like either there are some quality control issues at the manufacturer or the button is damaged in the transportation because of the weak package. Besides, the default key pressed confirmation tone is designed with extremely high pitch sound. It makes my ears hurt when I first use it. For the white knockoff, the keypad layout and number are identical to IPEVO FREE.1. However, even with the driver installed, none of the button works. I need to do everything through my computer keyboard and use the white knock off just as an external speaker and microphone. IPEVO FREE.1 comes with a cradle. You can stand up the USB phone for better organization and better look. Neither of the two knockoffs come with a cradle. Besides, IPEVO FREE.1’s installation CD is in regular size. Two knockoffs’ are in mini CD size, which cannot be used in Apple Mac computers. IPEVO FREE.1 is a Skype certified device. From the label at the back of the phone, we also learn that it is CE and FCC certified. The white and the black knockoff are not Skype certified. 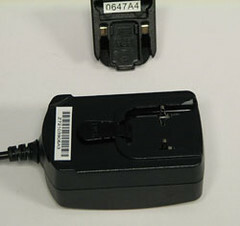 Although both knockoffs include CE and FCC marks on the label, none of them specify the product name or the model name. There is no way for me to confirm if the marks are real or not. IPEVO FREE.1 is Mac compatible. On the retail box, it shows IPEVO FREE.1 can work in Mac OSX system. The two knockoffs are not Mac compatible. Users can go download the latest driver update at the IPEVO website. It is very important because we all know how frequently Skype rolls out new revision. The link included in the white knockoff’s application actually points to Skype.com. I cannot find any manufacturer or software update link in black knockoff’s program. IPEVO FREE.1 takes the lead at every aspect I tested. The only better “specification” of the knockoffs is the price. The IPEVO FREE.1 priced in $30ish while the knockoffs are in the $20ish (including the shipping charge). However, considering the functions and the quality degraded in the knockoffs, the tradeoff is not worth it. If you need a more cost effective solution, there is the AU-100 (costs under $20) and P1K (costs in mid $20) to think about. They both provide better voice quality with more functions than the imitation brands. The most important thing is that these two phones are on the market for a long time now and are proven as great solutions by numerous users. You can find support / updates on these two phones easily on the manufacturer website or other retailers on Internet.